If the first radio button "New" is active, a text input field beside it gets activated and should be filled with any string by the user. 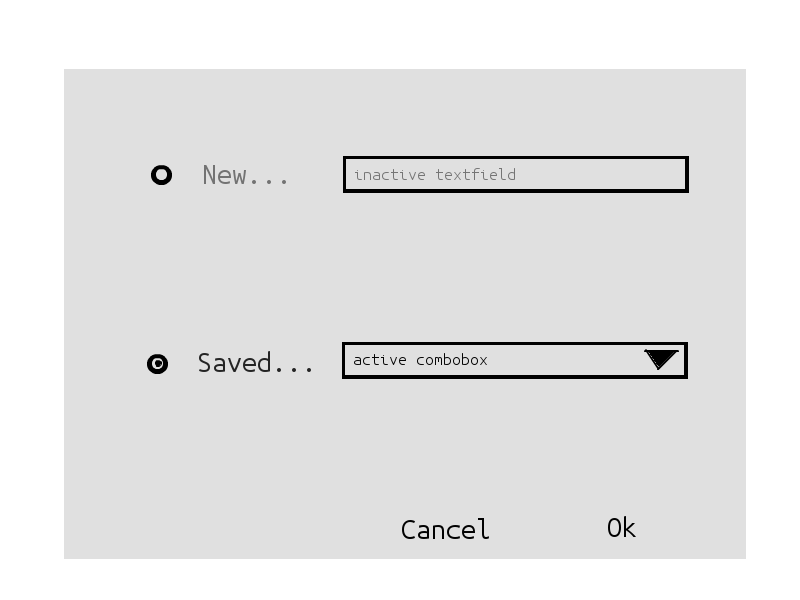 If the second radio button "Saved" is active, a combobox with predefined values gets activated and one of the items should be selected by the user. Is there any documentation or tutorial i can study? I did not find much useful information. Maybe you can give me some pointers in the right direction. And if there is a better way to achieve the same result with a better UI experience, i am all ears. Maybe only the combobox with integrated "new item..." field. I figured it out myself, was easier as expected. I created a Dialog with the IDEA "New -> Dialog" Wizard and created the necessary UI Elements with the UI Builder.